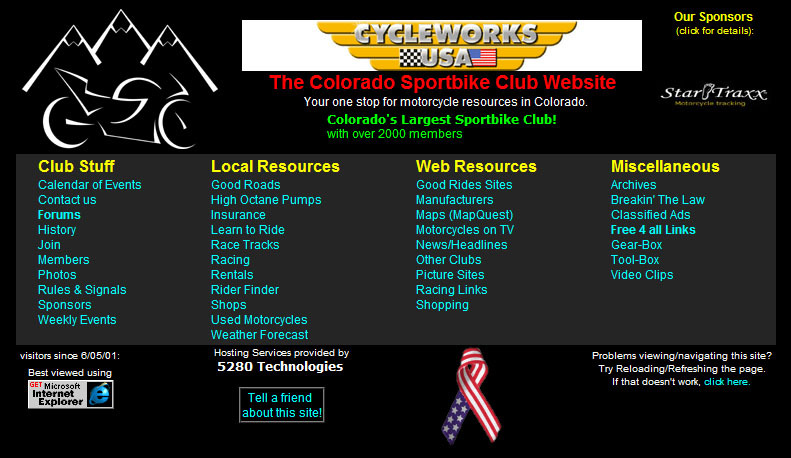 10 years ago next week I registered the cosportbikeclub.org domain name, and with Ralph's generosity to host the site on his servers, I started building the site. I initially registered it for 10 years, so this is the first renewal I'm having to do... it's kind of surreal - it doesn't feel like it's been 10 years already!! 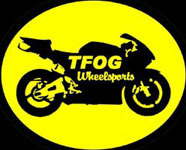 When we hit 250 members (long before forums were ever introduced into the mix), I figured it was safe to proclaim that we were the largest sportbike club in Colorado. The site has changed immensely over the years, and thanks to the introduction of the forums, the amount of time I spend maintaining things has been drastically reduced. 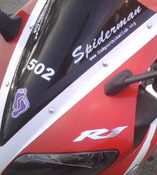 Prime example: Member List and Rider Finder were separate from the forum and maintained manually by me... But because these were features I felt the club should still have even with the forum, I decided to rewrite them, hooking into the database, so members could maintain their own info. Then Ralph changed the software, and I had to modify the code to make it work again. Congratulations.... Another reason for all of us to celebrate at whatever bar(s) we find ourselves this weekend .... 1 shot for each year ! Thanks for setting all of this up! CSC had forums by the time I came along, I can't imagine it without them!! Wow, ten years eh? For an anniversary gift that's toilet paper, right? Wow, 10 years! Who would have thought? Cheers to all of you have helped me avoid work/school for the past four years. the forum help you avoid school and work...? Raise your hand if you were around for the "Laguna List" spinoff from Gixxer.com? Yup HBD, and thanks to all the thankless volunteers that keep it going. Wow.. 10 years of drama?! Thanks, Bob and Ralph and all those that maintain this site. I've met some great folks here and had lots of good times with CSC members. Dude, I have like 5k posts. Either I avoid my work during the day, or I don't sleep at night. Guess what, I'm not real tired this morning. You figure it out. Happy Birthday CSC. Now go get drunk and find a loose woman! First rule of the internet: *bleep* you and everything you stand for. Second rule of the internet: FKZOR U AND RRYTHING U STND FR! Why the hell not? I was around loose chicks at 10. Of course they were my sisters, aunts, the chick that owned the bar we lived above, the ho's my pimp buddy "Tommy Two Fingers" used to bring around, and that damned Barbie Doll I found lying in a gutter outside my elementary school. She would do ANYTHING for a warm meal and a pair of untorn jeans. Man I miss that Barbie.